We last commented on our current list of short-sale target stocks on April 5th when the Dow was up 150 points on an intraday basis. As we wrote at the time, the last thing anybody was thinking about with the Dow up that strongly was the short side of the market. But in this market one has to be prepared for anything, and this means keeping a close eye on both long and short watch lists for opportunities that may arise independent of what the indexes are doing. That April 5th Short-Sale Set-Up Report turned out to be timely as the market staged a massive downside reversal on that day, sending the indexes lower from that point over the past several days and bringing these short-sale targets back into sharp focus. Over the past few days, several of these names have moved lower. Bery Plastics (BERY) rallied up into its 50-day moving average on Thursday and reversed. This represented a short-sale opportunity near the 50-dma once the stock moved back below the line. 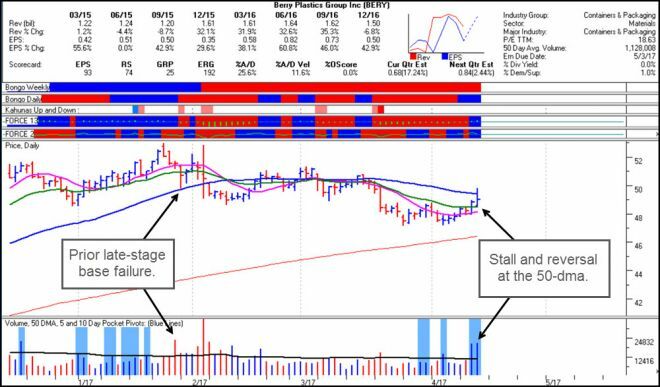 The stock remains in shortable position using the 50-dma as a guide for a tight upside stop. Caterpillar (CAT) was shortable as it breached the 50-dma earlier this past week per our April 5th comment, and is now extended to the downside. Nvidia (NVDA) is approaching the lows of its prior base formation and could be setting up for some sort of reaction bounce after undercutting these lows. This should be watched for, as any bounce could bring the stock up closer to its 10-dma or 20-dema which would offer a more optimal short-sale entry opportunity. Weibo (WB) is tracking below its 50-dma as it works its way sideways within a seven-week bear flag that has formed following its late-stage failed-base (LSFB) of February 24th. The tight action with volume drying up while the stock is sitting below its 50-day moving average may imply a higher-volume break to the downside. This is in a shortable position here using the 50-dma as a guide for a tight upside stop. U.S. Steel (X) was last shortable at the 20-dema on Tuesday of this past week per our April 5th comment. It is now extended to the downside. A warning to the wise (and not so wise): We would emphasize that short-selling requires extreme alertness and flexibility. In addition, one should not be shorting any of these stocks solely with the idea of using these reports as real-time alerts that they can mindlessly act on. 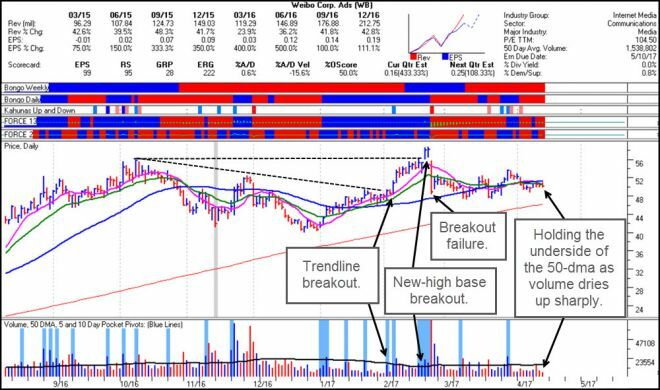 We only identify short-sale set-ups, and it is up to those using this information to understand and determine where potential lower-risk entries lie within the pattern based on the real-time price/volume action. This requires an essential understanding of short-sale principles. We strongly advise that if one is new to shorting then they should start with very small positions, no more than 5% or less of their total account value. We also highly recommend that would-be short-sellers read both How to Make Money Selling Stocks Short by William J. O'Neil and Gil Morales and its follow-up, Short-Selling with the O'Neil Disciples by Gil Morales and Dr. Chris Kacher in order to have a well-grounded sense of proper short-selling technique as we practice it.